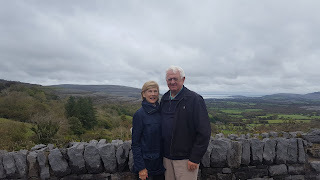 Terry and Diane Ritchey arrived in Ireland yesterday from London to begin their Irish tour with me. 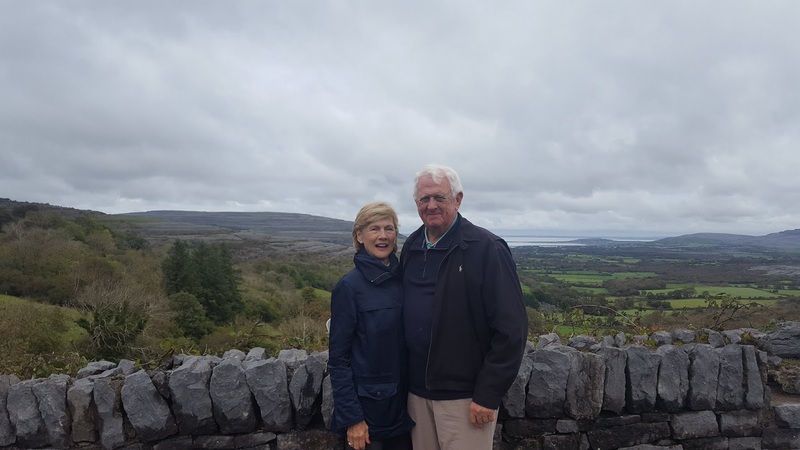 From the word go they were a joy to be with, and their excitement at being here in Ireland was evident from the word go. We made our way to Galway, where they were to spend their first night in the Harbour Hotel, in the center of this, my favourite Irish city. 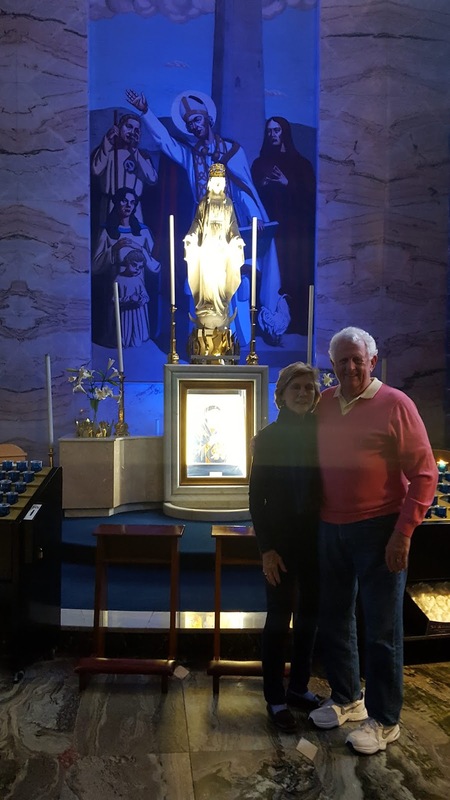 I brought them on a tour of the town, before leaving them to relax and enjoy a ramble through the city center, and a meal later on. 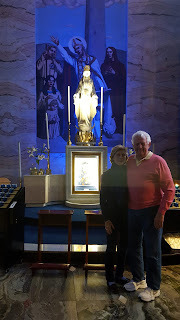 Another lovely picture of my new friends in front of the altar to Mary, the Mother of Perpetual help. Today, Sunday, we were off to the Burren of county Clare, and the awesome Cliffs of Moher. The weather forecast had been sketchy, to say the least, but it turned out to be really nice, not too much sun, but no rain. 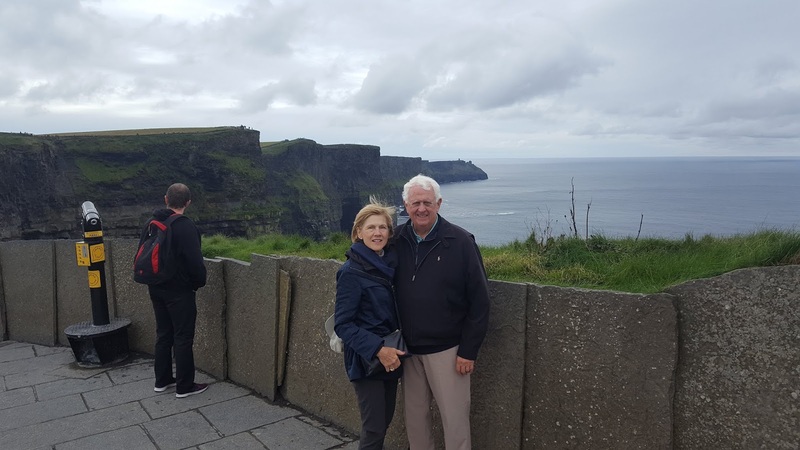 In this picture above, we have my happy pair, posing with the Cliffs in the background. 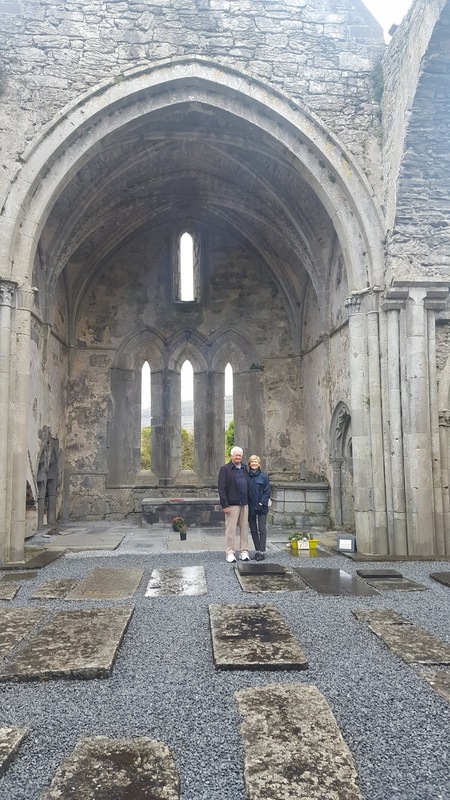 Corcomroe Abbey, in the Burren, dates back to the twelve hundreds, and is a most impressive ruin, and well worth a visit. 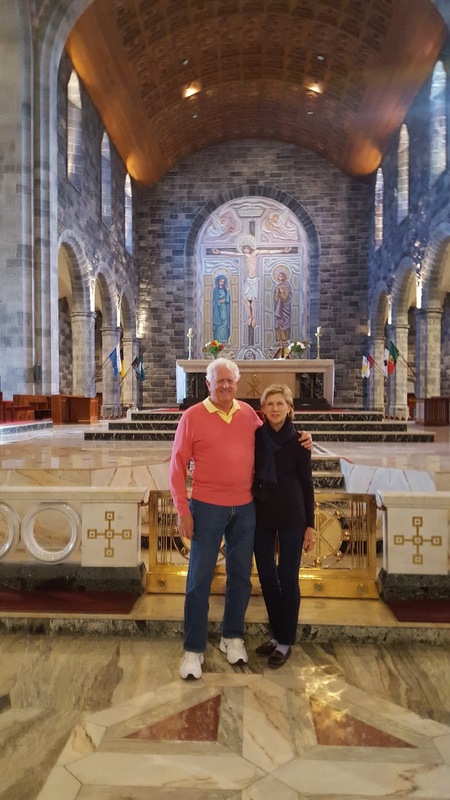 Here we have Diane and Terry, pictured inside the Abbey, and note the grave slabs marking the graves of those buried inside the church. 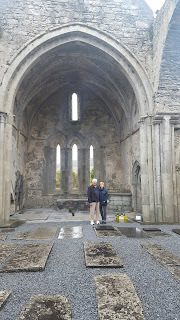 As the years went by, after the ransacking of many of our abbeys by the forces of the crown, people began to bury their dead inside these holy places, as it was sacred ground. 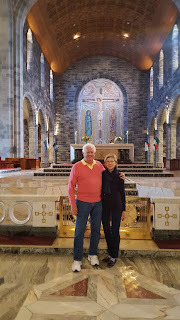 Terry and Dianne with the abbey and cemetery in the background. 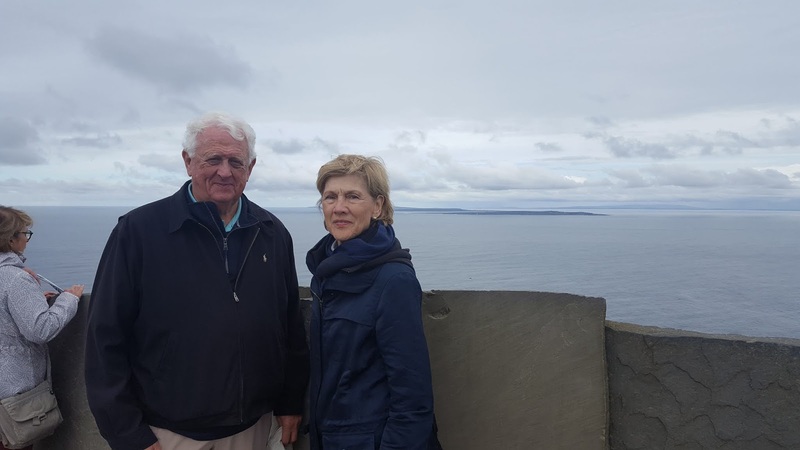 Pictured together again, high in the mountains of the Burren, with Galway Bay far off in the distance. All of this mountainous region was once upon a time the ocean floor. 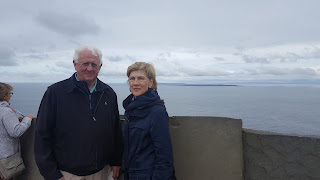 Another picture of Terry and Diane, with the Aran Islands, and Galway Bay, in the background. Finally today, we ended paying a visit to my home, where they met my wife Sue, and enjoyed some of her delicious apple pie and cream.Posing together in my garden we have Sue and Diane together. What a lovely day we had, and more to come. 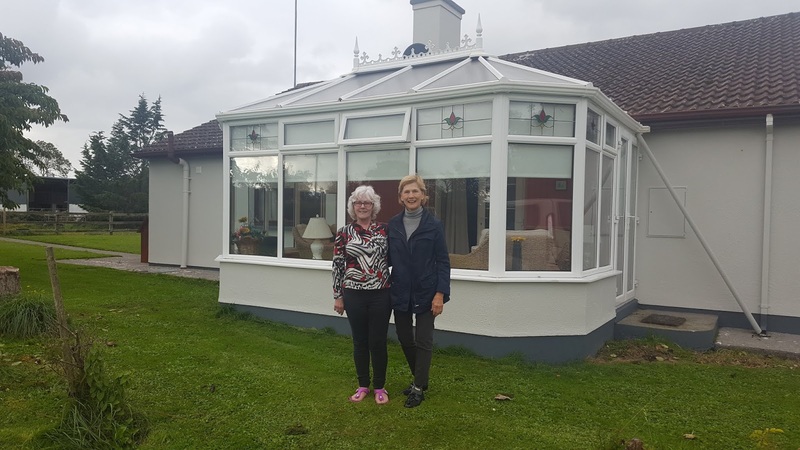 Maybe you can come and join us here on my Blog as we continue this tour of the the south and south west of our lovely country.